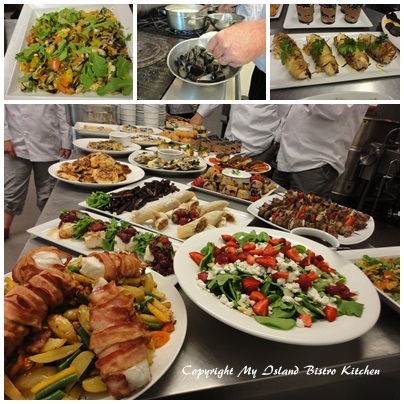 On my last day of summer vacation, I went to boot camp – culinary boot camp, that is — at the Culinary Institute of Canada in Charlottetown, PEI. Sixteen people formed the group for the full day “Island Flavours” boot camp. We were a mixed group that came from PEI, Halifax, NS, Montreal, QC, and Waterloo, ON. It was a packed day of activity (and work!) but it was fun! Now in their 4th year of operation, the boot camps (which started as a pilot project), are offered from May to October. Some are one-half day events while others are full day camps. A variety of bootcamps are offered that include half-day events such as Healthy Eating 101 and Chocolate and Wine. 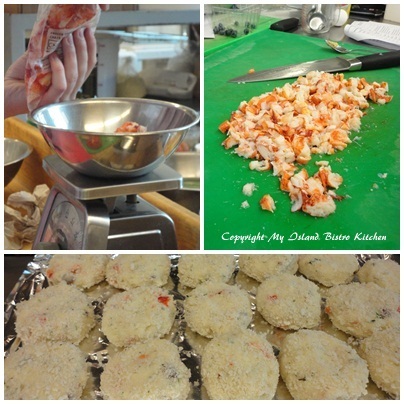 Full day boot camps include Lobster 101, Local Flavours, Seafood 101, Thrills on the Grill, and Seasonal Desserts. Half day camps start at $129 + GST/per person and full days range from $199 to $269 + GST/per person. Asked why the Culinary Institute, a teaching school for training professional chefs, started the seasonal culinary boot camps, Chef Instructor Jeff McCourt who teaches most of the camps, says the initiative began with “the onset of culinary tourism and, being a school already, they [the Culinary Institute) are fulfilling a short-term education component.” Culinary tourism is one of the latest vacation trends. Whether it is simply choosing interesting, unique, and memorable regional dining options where you are vacationing, attending foodie events (like the PEI Shellfish Festival happening in Charlottetown this weekend, for example) or food conferences, or participating in culinary boot camps at acclaimed cooking schools like the Culinary Institute of Canada, including food-related activities on holidays is a great way to sample local cuisine, try new food products, meet people who share culinary interests, and/or learn new cooking methods and techniques. Lindsay tells me the boot camps are gaining a positive reputation as shore excursions for cruise passengers visiting the port of Charlottetown. Currently, Oceania and Regent Seven Seas cruise lines have started offering the Boot Camps as shore excursions for passengers. The Culinary Institute has customized their boot camps to accommodate cruise ship visits and time lines. 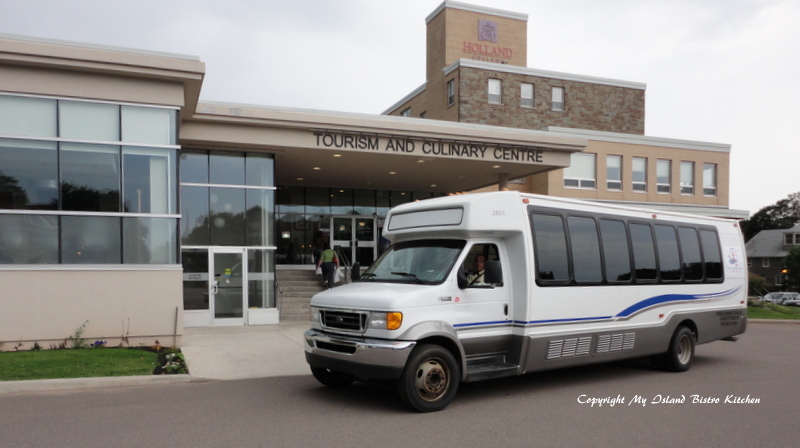 This is a wonderful opportunity for those passengers to taste authentic Island food, experience the Culinary Institute and cooking in a professional atmosphere, and go home with great Island recipes as a souvenir of their PEI port visit. As someone who is a frequent cruiser and a foodie, I know this is one shore excursion that would match my tastes! I also learned, from Lindsay, that some organizations have taken their employees to the Culinary Institute and used the boot camps as team building events. Now, that’s an innovative (and fun) way to bring work teams together! 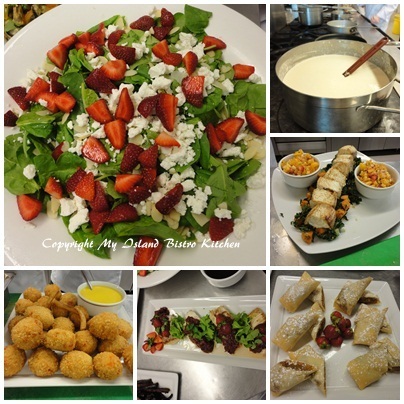 Attending culinary boot camp is also an opportunity to explore future career options. At the boot camp I attended, a dad from Montreal brought his Grade 11 daughter to the Island specifically to attend a couple of boot camps as she is planning a career as a chef. 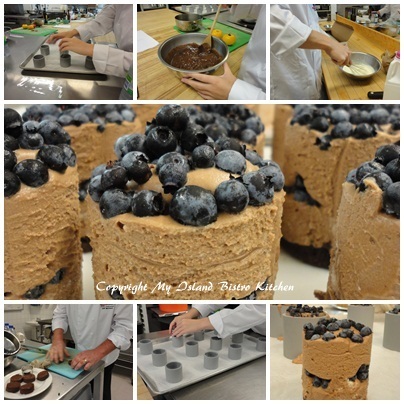 This opportunity allowed her to experience a large industrial-sized teaching kitchen, work alongside a professional chef, and to decide if this is the cooking school she might attend full time when she finishes high school. The day before this boot camp, Alison and her dad, Stephen, spent a day with the chef. 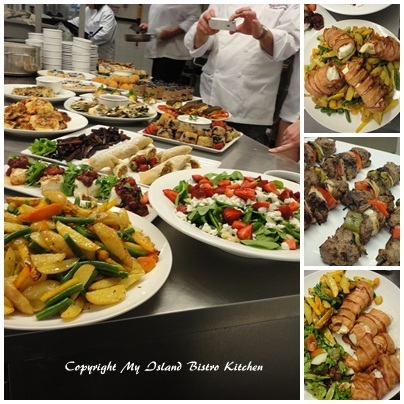 This is essentially a customized day of personalized attention where the participant(s) work with the chef on a particular subject of their choosing – in Alison and Stephen’s case, they chose to focus on preparing seafood. Alison’s comments after her culinary experience were very positive and there was no question that she thoroughly enjoyed it. The boot camps can accommodate a maximum of 16 participants and Lindsay tells me that, on average, their boot camps are comprised of 50/50 Islanders and tourists. On the day I attended, we had a number of family groups participating – Alison and her Dad, Stephen, from Montreal, the six-member Simmons/Tummon family from Waterloo, ON, who were back for their second boot camp in as many years, and a mom (Debbie) and her son (Anthony) from Charlottetown. Debbie told me this boot camp was her Christmas gift to her son and she decided to join him for the day in what was her sixth boot camp in three years. Asked why she had enrolled in six boot camps, Debbie said, “it allows me to try different things. I probably wouldn’t have made the food we made in the camp if I found them in a recipe book but, after participating in the culinary boot camps, I am more inclined to be more venturesome in cooking.” The Simmons/Tummon family – mom, dad, two sons and two daughters aged 15-22, told me their attendance was a Christmas gift from an Island relative (neat idea). Dad, Shawn, told me they enjoy the camps – “the girls like to cook and the boys like doing different things”. I thought it was fabulous to see these families spending quality time together, enjoying themselves, and learning different cooking techniques. Two other women drove from Halifax, NS, specifically to take this boot camp as an extended weekend get-away. So, now I’m going to share with you my impressions after attending the full day offering of “Local Flavours”, a new boot camp for 2012. For those of you regularly following my blog, you’ll figure my choice of “Local Flavours” was an obvious one given my blog focuses primarily on Island food products. The focus of the “Island Flavors” boot camp is on cooking with ingredients that come from the land as well as the waters around PEI. After dividing the 16 participants into four groups and assigning each group their recipes, the day started out with participants boarding a small tour bus, along with Chef Instructor Jeff McCourt, to go on a shopping expedition for ingredients for the recipes to be made later in the day. Chef McCourt handed each group $15 to buy fresh produce to enhance the recipes (note the main ingredients – fish, meat, cream, butter, etc., were all provided by the Culinary Institute and included in the boot camp fee). 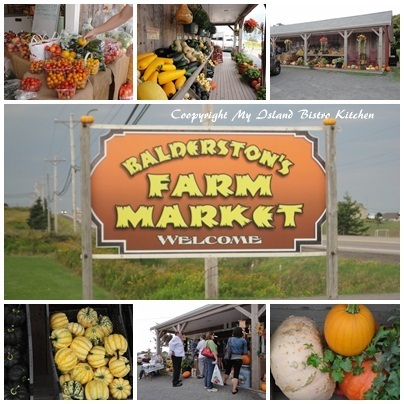 Heading along historic Water Street and passing over the Hillsborough Bridge to Stratford, our first stop took us to Balderston’s Farm Market. 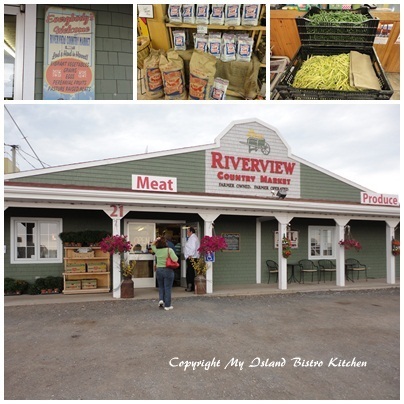 Participants deliberated over what fresh produce to buy and, once selections were made, everyone was back on the bus and on the way back across the Bridge to the Riverview Country Market which sells both fresh produce and meats. More purchases were made. 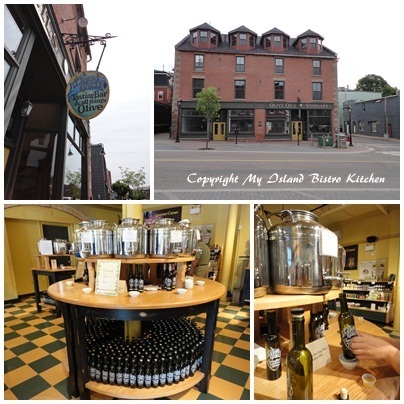 The last stop was at the Liquid Gold Tasting Bar and All Things Olive shop on lower Queen Street where everyone enjoyed tasting the many different kinds of imported quality olive oils and balsamic vinegars. Yes, more purchases! Back at the Culinary Institute, participants were outfitted in their official Culinary Boot Camp chef jackets and hats and then it was downstairs to the large kitchen facility. Each group assembled and started making their assigned recipes. 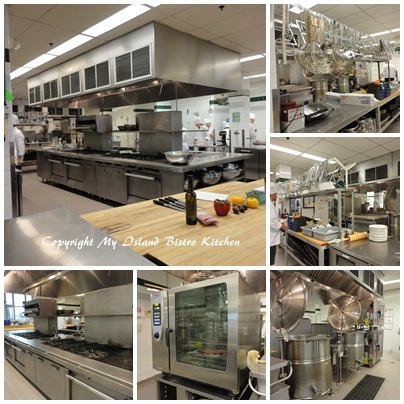 Participating in this kind of culinary activity gives participants the opportunity to see and work inside a huge, industrial-sized kitchen. And, I think some of my Paderno stock pots and pans are huge – un-huh – the Culinary Institute has pots so large that they are on floor stands – they make my pots look like little measuring cups! There was one frying pan that I declare was at least three times the size of my largest one! I wondered if I’d need a hydraulic lift to move it! The day was long but passed by very quickly because it was so busy. Each group was intent on their work. This is very much a hands-on culinary event. Don’t expect to sit back, relax, and be entertained by watching someone demonstrate how something is done. Ah, no. You work in these boot camps! It’s learning by doing. 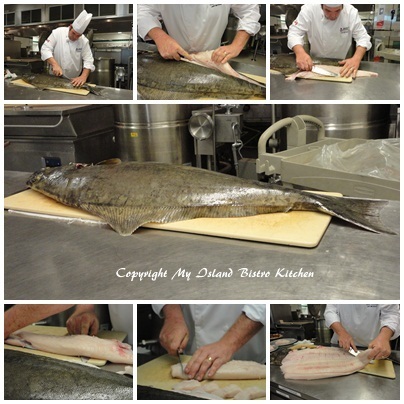 That said, there were times throughout the day that Chef McCourt did gather all participants around for specific demonstrations – for example, he showed how to butcher a 30-pound halibut and how filleting is done and steaks cut. Both Chef McCourt and his assistant, Colleen Neilly, were very accommodating and answered any questions participants had and were very willing to show participants how to do things. The basic recipes were provided but participants had the creative flexibility as to how they wanted to “dress them up”. For example, our group opted to prepare the halibut with a Cajun blackened spice rub and plate it over grilled yellow tomatoes and red peppers (bought at Balderston’s earlier in the morning), served alongside herb-roasted beets and chopped Chorizo sausage (purchased at Riverview Country Market). 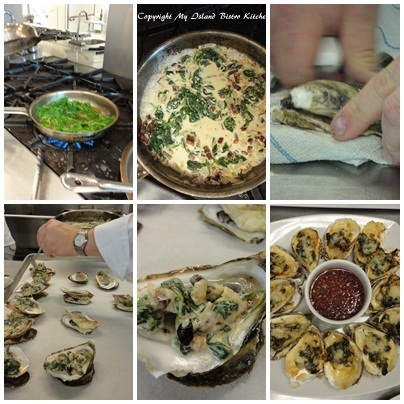 The recipes our group made were Potato and Lobster Cakes, Broiled Oysters (yes, I had my first oyster – but not raw! ), Pan-fried Halibut, and Vienna Truffle Tortes (that we dressed with blueberries from Balderston’s). I found it particularly interesting to visit the other groups around the kitchen and to watch how they chose to prepare their assigned dishes. 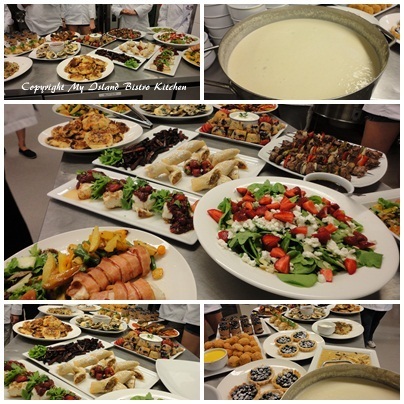 At the end of the day, we had to plate and present our dishes and spread them out altogether in buffet style. It was simply astonishing and amazing to see the superb quality of the finished products that looked (and tasted) so professionally prepared. Then, it was time to sample the fruits of our labour. After filling our plates, it was upstairs to the Lucy Maud Dining Room to enjoy our meal in style. The Lucy Maud Dining Room is the Culinary Institute’s teaching restaurant and it has one of the most commanding water views as it is situated just at the entrance to the Charlottetown Harbour. This was simply a fabulous day and experience. For the foodie and at-home chef, this is a rare opportunity to work alongside a professional chef in a large, fully-equipped kitchen (yes, their walk-in refrigerators are as large as my walk-in clothes closet!) and learn food preparation techniques from the professionals. At the end of the boot camp, participants walk away with a monogrammed boot camp chef’s jacket to keep, a booklet of recipes that were prepared during the day, great memories of a busy yet fun day, and inspiration and motivation to try new ways of preparing ordinary local foods. So, whether it’s a treat for yourself, a gift for those hard-to-buy-for folks who happen to be foodies (I’m thinking what a great wedding present one of these camps would be for newlyweds), an innovative team-building activity for your work group, or an activity to do with a group of friends or family members, a one-half or full day at the Culinary Institute’s boot camps is a great food activity and a sure way to have a memorable time. Oh, and the extraordinary buffet meal as the finale is pretty darn good, too! Still can’t get over the fact that we accomplished all this in one day! And, it all tasted so incredibly good! 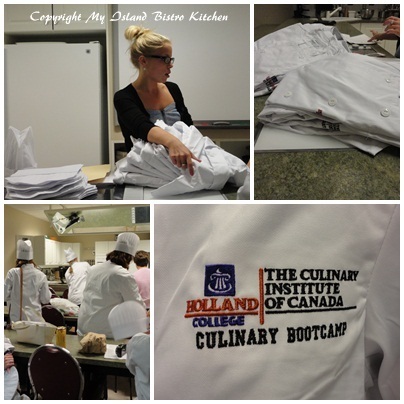 For more information about the Culinary Institute of Canada’s boot camps, visit their website at https://www.hollandcollege.com/bootcamps/bootcamps/culinary/full-day-camps. 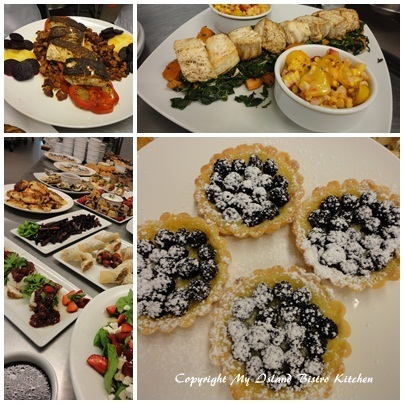 To whet your appetite, below is a sample of the kind of recipes participants experience cooking in one of these boot camps – this one from the “Local Flavours” boot camp. 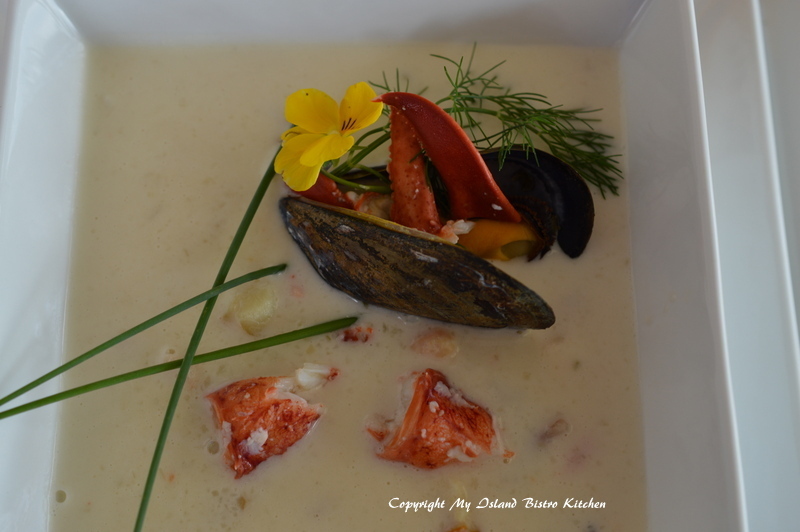 Shared here, with the kind permission of the Culinary Institute of Canada’s Boot Camps, is the recipe for Chef Jeff’s Seafood Chowder. This is a dandy chowder that has won awards at the PEI Shellfish Festival (and Lindsay tells me, more than once it has won!). This makes a very large pot of chowder but the recipe is easily halved or quartered as I did when I made it at home. The wonderful thing about seafood chowder is that it can be served as an appetizer in a smaller portion or, with a larger serving, as a main meal because most chowders are quite filling – and this one certainly is! The other great thing about seafood chowder is that, so long as you make up your quantity, you can use any selection of seafood you like and leave out any you do not care for. When I made the recipe at home, I didn’t have any Vermouth so I substituted Chardonnay which worked out fine. The other thing I would caution is to start “gently” with the Tabasco Sauce using only a few drops of it, then taste it and add more (if necessary) to your liking as, using too much of this hot sauce can quickly spoil a chowder beyond repair. A smooth, creamy,and tasty seafood chowder filled with a variety of seafood. In a hot pot, add the butter and onions. Sweat mixture until translucent. Add garlic and continue to saute until golden brown. Add the potato, Vermouth, milk, and cream. Cook over medium heat, careful not to scorch the bottom, for approximately 20 minutes until the potato is cooked. Puree the chowder base in a blender and season with salt and pepper. Return mixture to pot. Use desired seafood and retain all juice from its cooking process. Add to the chowder base. Add the diced, cooked potato for texture and season again. Serve and garnish with chopped chives.